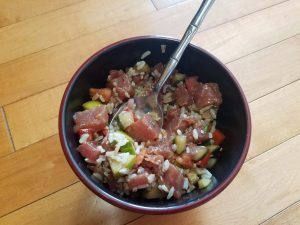 After a trip to Hawaii last fall, I became obsessed with poke and poke bowls! With so many variations, you could never get bored. Poke is made of, traditionally, raw tuna and a yummy sauce. Poke bowls have taken on a life of their own, becoming a new food trend all over the USA. Chefs are adding brown rice, quinoa, raw veggies, and inventing all sorts of sauces to top it off. The one thing I don’t like about ordering a poke bowl while I’m out- the cost. Save yourself some money and make your own at home. Get the rice going first. The usual 2 cups of water to 1 cup of rice. After it's cooked, let it cool. In the meantime, cut up the tuna steak into 3/4 inch cubes. Set aside in a separate bowl. Cut up the tomato, cucumber, red onion, and green apple into diced pieces. Cut the chives into tiny little pieces. Mix together in a separate bowl and add the sesame seeds and red pepper flakes. Poke Sauce: In the bowl with the chopped up tuna, add the poke sauce ingredients and stir well. You may need to put the honey in the microwave first to make it more liquidy to stir in. 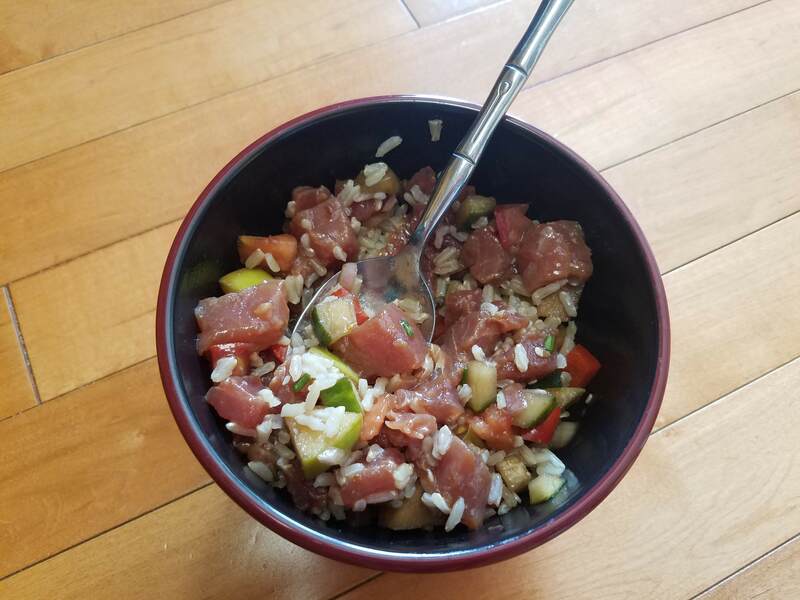 If you think ahead and have time, marinate the tuna in the poke sauce before creating your bowl. You can add many things to a poke bowl to make it more to your liking. Here are some things to try: ginger, teriyaki sauce instead of soy sauce, green onions, chili peppers, wasabi, or garlic; quinoa or chia seeds. Mix up the veggies by adding celery, radishes, edamame, shredded carrot, avocado, or red bell peppers. Or go for a more fruity bowl by adding watermelon or mango!